At midnight, once the last diners have departed from St John Bread & Wine, the head baker & pastry chef, Justin Piers Gellatly, wheels his gleaming black motorcycle in from Commercial St and parks it in the middle of the floor. The restaurant that feels so large when it is full of customers seems to diminish once it is empty and all the chairs are stacked up. Now the chefs are gone from the kitchen, and until the clock on Christ Church, Spitalfields reaches eight o’clock in the morning, the place is the sole preserve of the bakers. Justin greeted me with a cheery “Good Morning!” when I arrived shortly after twelve to join the team, as he and Luka Mokliak both set to work to make four hundred loaves and have them ready before the chefs reappeared in eight hours. 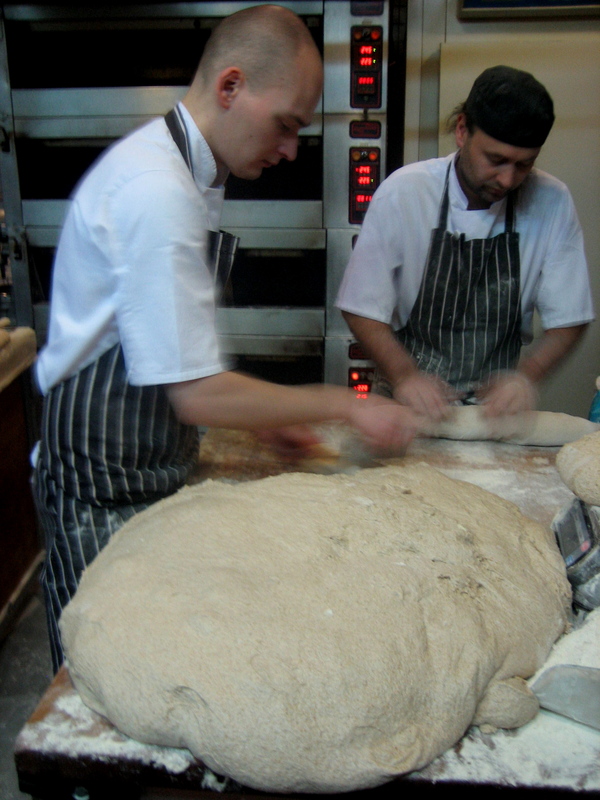 At once, the huge porridge-grey lumps of gelatinous wet shining dough were hauled from the proving cupboard – where they had been sitting since they were made yesterday – and, using scales to ensure a consistency of size, Justin and Luka wasted no time in cutting up the living dough into pieces and shaping them into loaves. First in the sequence of different loaves comes the sourdough, that takes longest to prove because it is a natural yeast. Once it is shaped, each piece of sourdough is placed into a proving basket made of a single spiral of bamboo that imparts the characteristic design of concentric circles on the dough. It is a furious business to prepare one hundred and sixty of these, but Justin and Luka make short work of flouring the baskets, shaping and working the dough with swift efficiency, folding it always inwards like the corners of an envelope. As they filled the baskets, they arranged them on trays and stowed them under the table in racks, then, once the racks were full, the loaves were stacked on counters and spilled out onto the restaurant tables, to allow the yeast do its work for a few more hours before they go into the oven. After the sourdough, Justin and Luka set to work on the white, the rye and the raisin breads, which have live yeast added to the dough and prove more quickly. Sandwich loaves and baguettes are arranged on linens to prove, with the cloth folded in pleats to prevent the loaves sticking to each other. By two-thirty all the loaves were shaped, and the warm air was thick with a delicious hazy aroma of dough, and by three o’clock the first white loaves were in the oven. The rhythm of the night changed as the first flurry of activity was complete and Justin shifted his attention to baking, while on the other side of the room Luka made dough ready for tomorrow night. Using a peel (a long wooden paddle), Justin loaded the loaves into the four shelves of the deck oven. 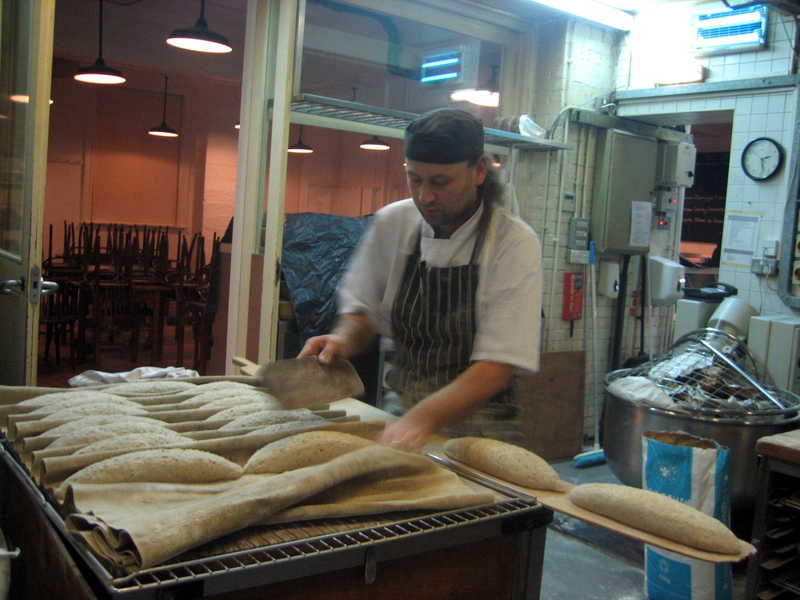 Each of the doughs are ready to go into the oven at different times, and their readiness can vary according to all kinds of factors, so Justin was constantly pulling, patting and sniffing his loaves to assess the progress of the proving process. 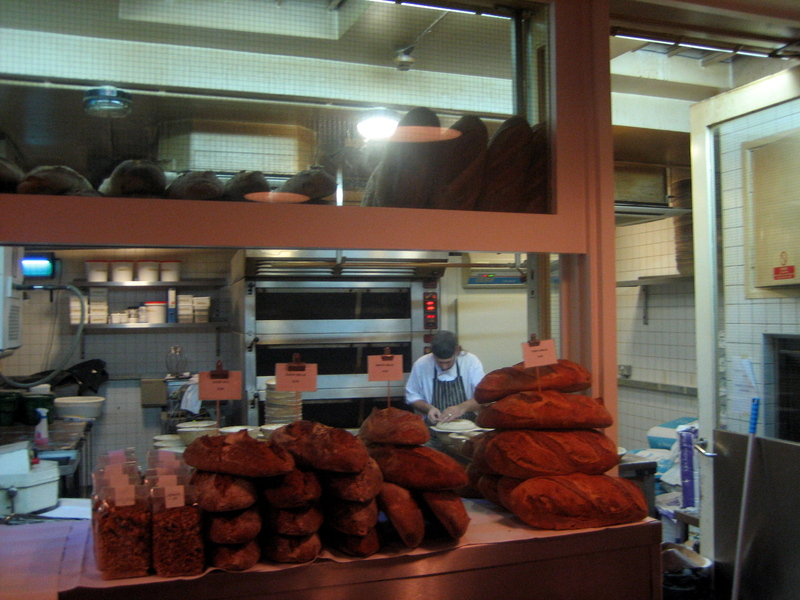 Equally, each of the doughs need different baking times and conditions, which requires judgement too. 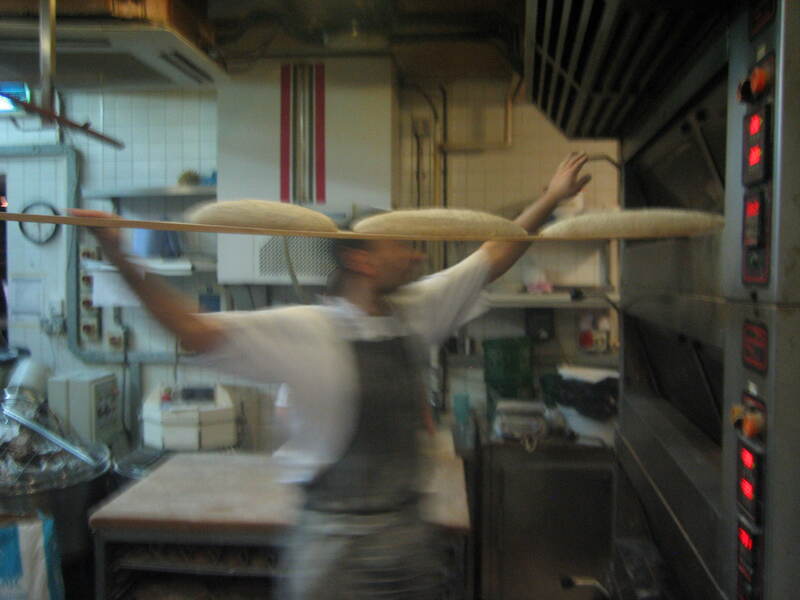 Justin hovered for hours, sweating and pre-occupied, alternately checking the loaves in the oven and the dough in the racks – all in order to bring out one rack of loaves when they are baked, at the same time another batch reach the moment they are ready to go in. It is a challenging game of weighing all the variables and every night it is different. On this night, the white dough was a little dry, which required slower cooking and gave Justin concern for his loaves waiting to go into the oven. As he tipped each loaf from the linen onto the peel, Justin shaped it up again gently, then scored the surface with a razor, which allows the crust to open up in the oven and permits the loaf to bloom. Justin used an old fashioned double-edged razor to do this because he has not found a knife sharp enough to match the resistance of the dough, which is sufficient to blunt two razors each night. “If you lose one of these everything stops!” he declared, holding up the razor with an absurd grimace. Once the loaves were in the oven, Justin flipped them onto the baking surface with practiced ease and, when the shelf was full, he sprayed steam from a diffuser into the oven to create the thicker, more leathery than crisp, crust that is characteristic of his bread. At five, the butcher arrived with his delivery for the restaurant, placing it in the food store housed in the former secure vault of the building, that was once a bank. During the earlier part of the night the tempo of conversation had been brisk as Justin maintained a vigorous buoyant energy, but now in the earlier hours the pace was quieter. Justin was computing all the baking in his mind, while Luka was quietly measuring out flour and salt and water, and conscientiously stowing tomorrow’s dough in the prover. 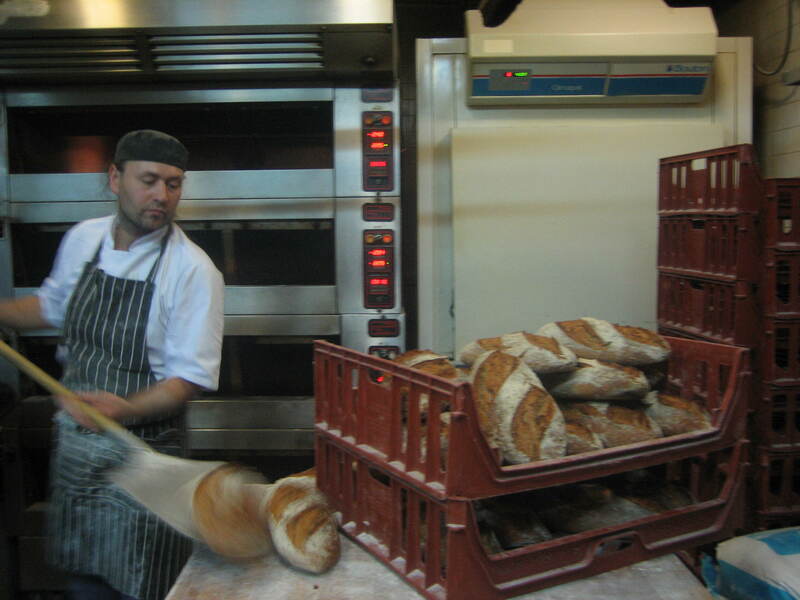 Last to go into the oven were the sourdough loaves as dawn came over Commercial St and, at five thirty, Justin opened the double doors of the restaurant, admitting the cool fresh air to ameliorate the steamy atmosphere of the baking. By the time the milkman arrived with his delivery, the first loaves were ready and Justin was relieved that the white loaves had turned out magnificently. Spontaneously, he held up a family loaf in triumph and I recorded the glorious moment with my camera. Making up the bread orders in trays among the restaurant tables, Justin ended the night by taking the finished loaves from the oven as they were ready and stacked them up to create a satisfying display, still radiating heat and all discreetly crackling to themselves as they coolled down – an extraordinary sound I had never heard before. “That’s what first drew me to baking!” revealed Justin with a proud grin. Accepting his gift of a loaf, I carried my beautiful sourdough home with me as the sun rose, grateful to have enjoyed the company of two fine bakers and witnessed a commonplace yet magical routine that has been taking place in these streets each night as long as people have been living in Spitalfields. 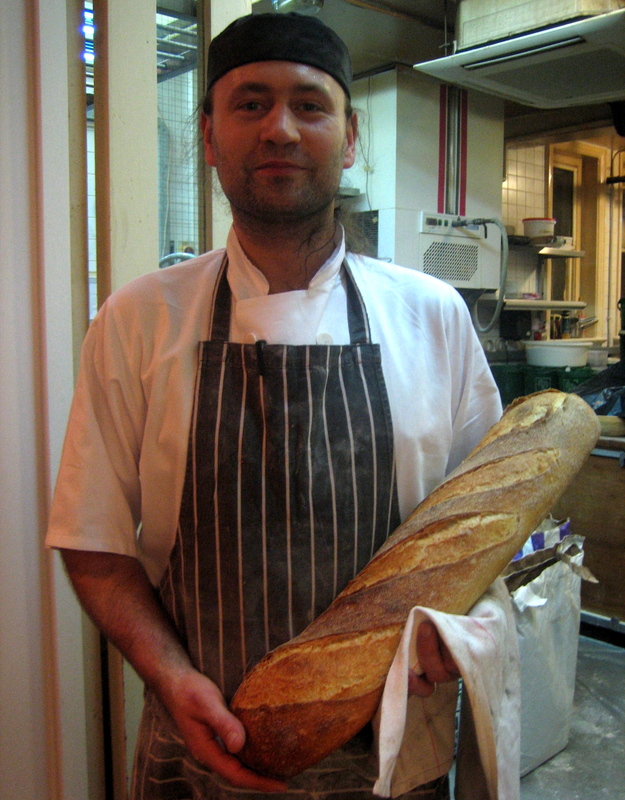 A superb write up of a night in the bakery. Much like our own! oh it’s a bee-you-ti-ful TING! I can smell it from here, nothing beats the smell of freshly baked bread. Fascinating! I can smell the newly baked bread! Thank you, gentle author! Bread making is an almost magical process. So this observation of a large scale bake with all the timings and stages and ins and outs of the oven seems almost miraculous. Yet it is such a human process with the bakers applying all their judgement from years of experience. The baker’s comment about the night passing so fast is evidence of the ‘flow’ he achieves where all of the calculations and judgements made happen almost without conscious thought in a place where time almost disappears. Perhaps this is a kind of magic: the magic of the focussed craftperson in full flow. A very precious experience to have or to witness. Many thanks gentle author for your stimulating witness here. My last name in German means bakery. Munich Germany 1800 Baker family carried the name but not the skill/guild training to USA. It was the Northern German Granny H. and Ohe that was the baker and cook. Bakers are hard to find in Central MS USA that know how to create a good bread, biscuit, Danish. We have to go up to the Mo. border into the German and Jewish sections of the State where the best bakeries are located-St. Louis MO USA. Some of the old German bakery families who had their bakeries and stores under family grocery stores are gone. We had a family bakery under a family’s old five and ten cent store a half block from an old school in South St. Louis. Best article is this above.